Grand central market in downtown Los Angeles is a city landmark. Opened in 1917 the stalls at this market serve everything from mexican food to chinese to ice cream cones.There's also a large produce area as well as butchers, bakers..maybe even candlestick makers. I came for the tacos however so I didn't muck about too much. I made a b-line for tacos tumbras A Tomas, a stall that serves tacos, tortas, and burritos. Their tacos are famous for their size and the amount of food you get for your bucks. The tacos are so large you literally need a fork to eat them. You also get two corn tortillas on the side for every two tacos you order so you can make your own tacos on the side of you want to. I ordered a carnitas taco and an asada taco. Word to the wise,don't order more than two tacos for yourself. There's so much meat on each taco that it's like ordering a carnitas plate and a carne asada plate and getting 4 tortillas on the side. And for only $4! After you order the guys behind the counter quickly spring into action and with lightning quick reflexes spoon mounds of meat on top of fresh corn tortillas. If you get your tacos con todo they toss some onions, cilantro and red sauce on the meat and plant a fork in the middle of the plate. I made an attempt to eat the first taco like I would any normal taco but I ended up making quite a bit of use out of the fork. The salsa roja spread over the fried pork was delicious. 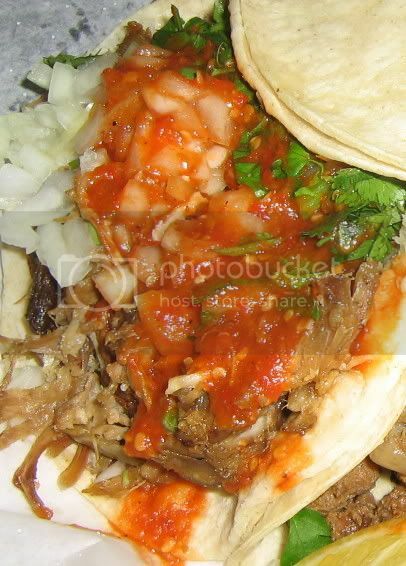 The pork was soft and tender with plenty of juice which is always a good sign for carnitas. The asada was equal to the task. The beef was tender and slow cooked with a roast-like quality. With my extra tortillas I made a hybrid taco of carnitas and carne asada and boy was I dancing. 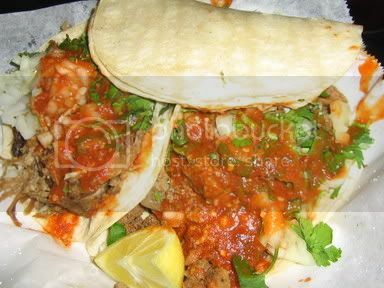 The meats and the luscious salsa roja combined together to make quite a taste explosion. As far as the salsa roja it had some spice to it but I didn't have to reach for a cold beverage. It takes a really kicked up salsa roja to make me reach for a cold one these days. Before this taco hunt I put myself through an extensive training program of chugging down bottles of tapatio and tequila as well as mind over body exercises to prepare myself for the harshest of chiles and salsas. The closest I've come so far was at Don Felix. The habanero salsa at Don Felix made me curl up into a ball but in the end made me stronger and prepared me for my ultimate conquest: to try every taco in Los Angeles, to not back down from any salsa roja and to ultimately become taco laureate of this fine city. 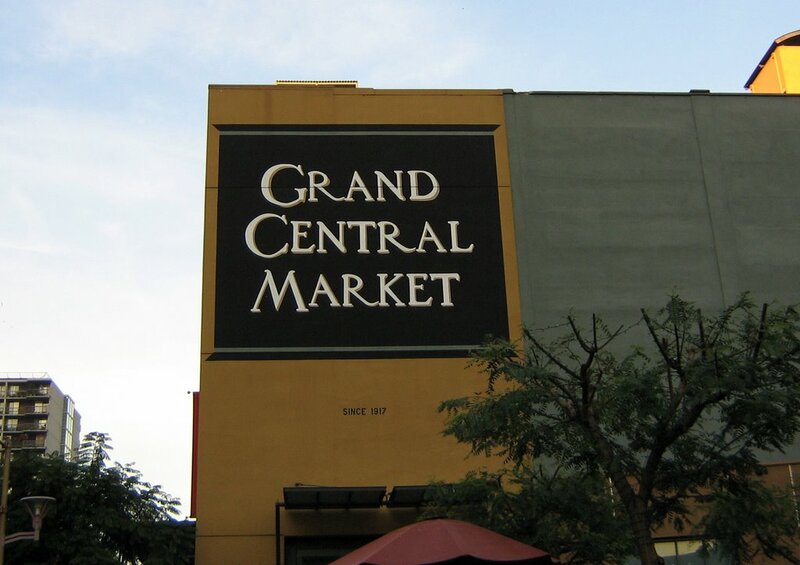 Every Angeleno should make a visit to Grand Central Market. I can't believe it's taken me this long to do so. Dude, imsothere. A quick bus ride from 'SC? Fabulous. Westside taco alert: There's a new taqueria going up on Venice, between Inglewood and Grand View, that you're going to have to hit up when it opens. Slurp!!! Dude, get your fanny to South Texas, we would value your input on our fare! discovered your blog via marginal revolution. we need more people like you. actually, i need just one who lives in the sf east bay. come to think of it, what i really want is one decent nearby taco stand, i don't need anyone telling me how good it is. anyway, i love tacos and taco writing and you are a master. i've only read a few posts, but it appears you don't do cabeza? too many fatty bits? not to gloat, but i am with a girl who loves tacos. however, she elides cilantro. also, she thinks it is perfectly acceptable to eat tacos at home after a five minute car ride. so maybe the joke is on me. I love Grand Central Market... could spend a whole day there. Congrats on the Fark link! The Central Market is one of the best secrets of LA... I lived in LA ten years ago while working up at the Amanson theatre and would take the Angels Flight down for lunch. No-one who worked at the theatre and was an LA resident seems to even know about the market.... shame. You are famous now...watch out for super-stardom! I'm in agreement with you on Taco's Tumbres A Tomas. Good stuff. You don't have to do Ana Maria, it's owned by Tomas. You could try Roast Meats to Go, I think Tomas split off from this place around 15 years ago. much horrible news! 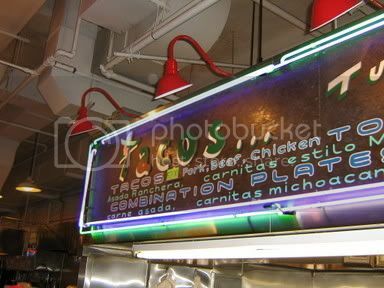 Taqueria Chihuahua on Olympic & 20th in Santa Monica is closing! Apparently the beasties @ Sony BMG are killing my beloved Santa Monica Burrito place! You must try their tacos before they disappear. have no fear...taqueria chihuahua is moving to mar vista to the location slightlyslack mentioned. Where did you read that sony bmg is buying the property and who is Gir? Dude! Chihuahua is moving? The dudes there told me that they didn't know what was happening (but this was 2 or 4 weeks ago and I was in shock)... the dude @ the window told me the story: said it was Sony who owned the property and that they couldn't seem to find another place in SM to move to... and the 'new' location sounds a little far for my lunch needs. As for Gir, well... Gir is Zim's robot and he loves the little tacos: he loves them good! after seeing those pictures my mouth was watering! I had to run out to the closest place. While there I saw they now have a website and that it wasn't listed here. No mention of Fish Tacos!!! I've actually had to resort to wearing sunglasses and a hat in public to disguise myself but once I pull out a taco the paparazzi swarm! fish tacos at tacos baja (formally tacos baja ensenada) are on my radar. I just have to get out that way. I have been going there for years, definately worth the drive! After reading the glowing review of Tacos Tumbras A Tomas, I was so excited to try it. We had friends visiting from out of town whom we wanted to take out for authentic tacos. I agree the size of the tacos was impressive, however, the tacos were very greasy. The meat was fatty and the salsa did little to mitigate the flavor. After reading about Tacos Tumbras A Tomas, I was very excited to try it. I agree that the tacos were indeed very large, however they were also very greasy. The meat was very fatty and the salsa did little to mitigate flavor of the taco. I go to Tacos Tumbras A Tomas in Grand Central Market ALL the time...but not for tacos. I go there for the Tortas. They are out of this world! It was here that I first discovered the Torta, and although I have seen them many other places since, none have been as good as the ones at Tacos Tumbras A Tomas. I have made many trips to Downtown Los Angeles just to eat Tortas at this place, and I start tasting them as soon as I get the idea to go downtown. Try the Beef Torta with the works. It is out of this world!